Suten quietly congratulated himself. This was the perfect place to hide. Already worshipped by the indigenous Human population, he could remain here undisturbed. He needed to rest from some time, it had been a long journey, over 12 light year across the coldness of space. Here he could absorb energy from the heat of the midday sun, and it was very hot here. He began to make plans for his takeover of this small planet, all he needed now was time to replenish his energy. He laughed out loud as he recalled the moment of his escape from his prison of two thousand years It had actually been very easy, he thought. The guards had become slow and lethargic, they had made mistakes. He knew they would, after all, he had time to wait, nothing but time. Glemm had picked up the trail at last. It had take a while, but he knew that somewhere there would be evidence of the vast expense of magical energy required to transport his old enemy away from this place. How could they have let him escape, he wondered? He called upon the elemental forces to begin the chase. He would have to be careful, Suten was dangerous. He would have no qualms about starting a full-scale elemental battle wherever he was, and at any cost to his surroundings. Glemm remembered how an entire solar system had been destroyed prior to Suten's capture. That was why he had been incarcerated for the remainder of his existence. The trail led to a small blue-green planet, the third of nine orbiting a yellow star. Suten was bound to be somewhere in the hotter regions. Fire had always been his favourite elemental force. It was more destructive than the others. This was not going to be easy. Direct confrontation would be disastrous for all the life-forms on the planet. No, there had to another way. Glemm needed an agent, someone he could help to defeat Suten without arousing too much suspicion. Who would be the best choice certainly not a Human, they were far to stupid and clumsy. They couldn't hero their way out of a paper bag. The sort of hero required needed to be smart, cunning, fast, and willing to travel! 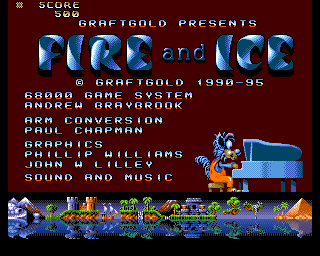 Fire & Ice is a platform game spread across a number of different worlds, each with a different theme, the game features many levels, power-ups, bonuses, and hidden secrets. I've tried this under ArcEm with RO 3.1, but I can't get it to work. What difference is the "Boot floppy" option supposed to make, compared to running it from the filer window? With "Boot floppy", I get as far as the "Insert data disc" screen, but no further. Ctrl+Shift+F2 does nothing. The floppy images are on HostFS. Is HostFS available when "Boot floppy" is used? Without "Boot floppy", launching from the filer, I also get to the change disc screen, but Ctrl+Shift+F2 only made the on-screen animation stop. 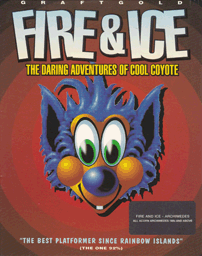 I've named the discs "Fire1" and "Fire2", typed to "Floppy". If you look at !ADFFS.Obey.F1015401 you'll see what the script does. It reserves memory, sets the FDC emulation to 710, sets the screen size and turns off the Hourglass. Thanks, I got it working. I think I wasn't waiting long enough for it to change disc. I ran it via the "Boot floppy" option. I think ArcEm's having trouble with the mid-screen palette changes or something, because it's quite flickery. I just tested it myself (on a Pi), ArcEm does take a while to swap discs - understandable though considering its full machine emulation. The palette isn't changing at all, as I don't believe ArcEm passes through the VSync. You'll have to put up with green and blue all over I'm afraid. You need to enable 16bpp rendering mode to see palette switching. Press both Windows keys together when ArcEm is running. 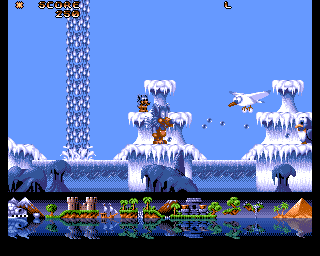 That opens the tweak menu, and press "1" to switch from palettised 256 colour display driver to standard display driver. Or you can pass the command line argument to the binary that makes it use the standard display driver.